A new wing of the Honolulu Zoo tiger exhibit was dedicated yesterday. Djelita, one of three Sumatran tigers, roamed inside the new wing. The Honolulu Zoo dedicated yesterday a new wing of a tiger exhibit that zoo officials hope will boost the numbers of endangered Sumatran tigers and help revitalize the zoo. The nonprofit Honolulu Zoo Society provided most of the funding for the $210,000 wing, which is 75 feet long and 45 feet wide. Two tigers flown in from an Indiana zoo, a male named Berani and a female called Chrissie, join Djelita, a female tiger who has been in Honolulu for two years. Zoo keepers hope Berani and Chrissie will mate to increase the population of Sumatran tigers. "The benefit to the public is that for the first time ever, we may have cute tiger cubs in the zoo," said Ken Redman, the zoo's director. "For us it's about conserving this species." Sumatran tigers, solitary hunters that are the smallest of all tigers -- with adult males reaching an average of 8 feet in length -- inhabit the Indonesian island of Sumatra. 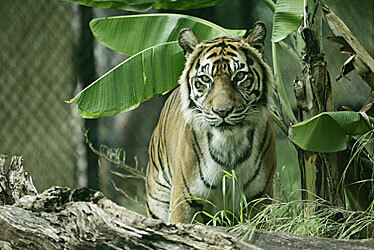 There are an estimated 500 Sumatran tigers left in the world, 200 of which live in zoos, Redman said. The earliest Chrissie could give birth to cubs is in March, Redman said. The cubs would stay in Honolulu until they are about 3 years old before moving to another zoo to increase conservation efforts. Mayor Mufi Hannemann said the tiger exhibit would serve as another marketing tool for the zoo. A new logo for the zoo was also unveiled as part of its branding campaign.